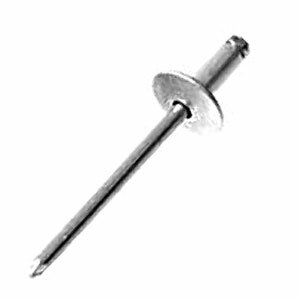 PRODUCT: 1/8 x .032 - .125 (1/32 - 1/8") GRIP, LARGE FLANGE ALUMINUM BODY WITH ALUMINUM MANDEL, BUTTON HEAD (OPEN/DOME), BLIND POP RIVETS. MILL FINISH. 500/BOX. PRICE/BOX. Large flange Aluminum/Aluminum rivets provide a greater bearing surface for fastening soft and brittle facing materials and with oversize facing holes. They are commonly used for automotive trim attachment. Equal to automotive OEM specs. Works well with soft materials, where the increased flange diameter protects the integrity of the application. Low cost alternative to screws, bolts, or spot welding. Conform to IFI specification 114 and are quick and easy to install with hand or power tools. Both aluminum bodies and mandrels have a polished finish and are sealed to prevent discoloration.